The 11th Hour Series of revision guides have been designed for quick reference. The organisation of these books will involve students actively in the learning process and reinforcement of concepts. At the end of each chapter there will be a test including multiple choice questions, true/false questions and short answer questions, every answer will involve an explanation. Each book will contain icons in the text indicating additional support on a dedicated web-page. 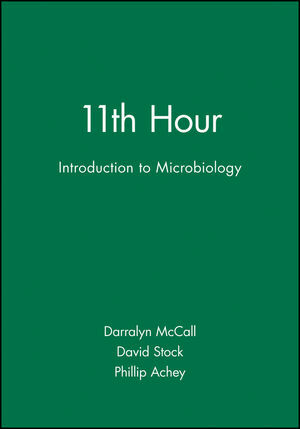 Darralyn McCall and David Stock are the authors of 11th Hour: Introduction to Microbiology, published by Wiley. Unit I: Structure, Physiology, and Control of Microorganisms. 2. Chemistry Background for Microbiology. 5. Energy Metabolism: Respiration, Fermentation, and Photosynthesis. 6. Catabolic and Anabolic Pathways of Microorganisms. 10. Microbial Genetics: Reproduction and Metabolic Regulation. 11. Microbial Genetics: Transfer of Genetic Information Among Bacteria. Unit III: Medical Microbiology, Immunology, Environmental and Applied Microbiology. 12. Symbiotic Associations, Microbial Pathogenicity, and Epidemiology. 13. Host Defense Mechanisms - Nonspecific. 14. Host Defense: Immunology - Characterization of Antigens and Antibodies. 15. Antigen-Antibody Reactions in Host Defense and in Serology. 16. Infectious Diseases Caused by Bacteria. 17. Infectious Diseases Caused by Viruses. 18. Diseases Caused by Protozoa, Fungi, and Algae. 20. Biotechnology and Applied Microbiology.